This apple slab pie is easy and quick to make and you don't even have to struggle with making your own dough; a store-bought puff pastry will work just fine. You can use your favorite apples for this but there's nothing quite like a caramelized, slightly tart granny smith. I should say this though; if you're serving more than 4 people, you ought to double the recipe and make 2. That's easy since a package of puff pastry comes with two sheets! 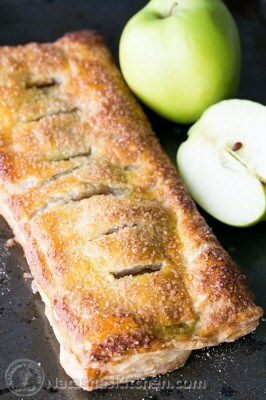 How to Make an Easy Apple slab pie: Preheat Oven to 400˚F. In a large skillet, melt 4 Tbsp butter over medium heat. Add sliced apples and cook, stirring occasionally until lightly browned (6-8 min). Reduce heat to low and stir in 1/4 cup brown sugar and 1 tsp cinnamon. Continue to simmer, stirring occassionally until apples are soft and caramelized (5 min). Arrange apples in a tight row lengthwise down the middle of one puff pastry sheet leaving a one inch border on all sides. Pour remaining syrup from the apples over the top of the apples. Brush your beaten egg around the edges of your pastry. Top with the second pastry sheet and press down on the edges to seal. Cut 6 (1-inch wide) slits down the center of your pastry to create vents. Brush the pastry with egg wash and sprinkle the top generously with coarse sugar. Bake at 400˚F for 15-17 min or until top is golden brown.